EVISCAN > Blog > Confront EVISCAN with an exciting Challenge! At EVISCAN, we are always looking for new projects and ideas to find solutions for challenges our customers face and to extend our technology for new and relevant functions. You can support us and benefit from this at the same time. Send us your ideas: What should we analyze using EVISCAN? Which are the tricky challenges you are dealing with? Who knows – maybe EVISCAN can help you coping with just that soon. You ask the questions – we will potentially answer those in one of the next experiments. Challenge EVISCAN! Next to the main focus of the EVISCAN, the securing of latent print evidence, we have conducted several experiments e.g. 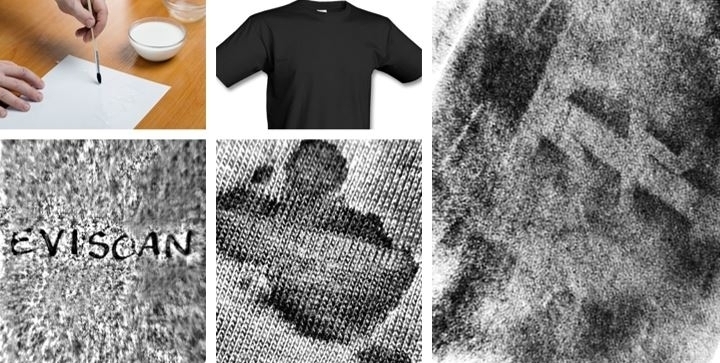 with secret ink, bodily fluids or tire traces on a pair of Levis – as can be seen on the pictures below. Thus, there is no limit to your creativity and type of challenge. The submitter of the proposal declares consent with the above mentioned conditions. Specially prepared exhibits should be used for the experiment. The execution of the project can be done together with the submitter of the proposal or by German eForensics alone.